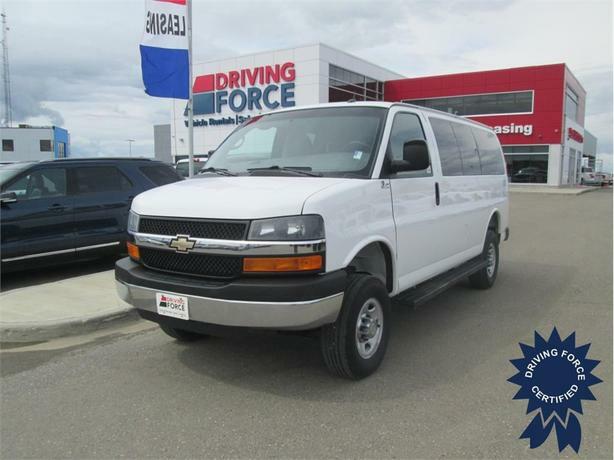 This 2015 Chevrolet Express 2500 12 Passenger 4X4 Quigley Conversion Van comes with 135-inch wheelbase, heavy-duty electronically controlled six-speed automatic transmission, 3.42 rear axle ratio, swing-out passenger side door with a 60/40 split, 2-3-3-4 seating configuration, custom cloth seat trim, heavy-duty trailering equipment, 6-way power adjustable driver seat, rear-window electric defogger, front and rear vinyl floor coverings, engine block heater, platform running boards, and GVWR rating of 8,600 lbs (3,901 kgs). The Vortec 6.0-litre V8 gas engine provides 342 horsepower at 5,400 RPM and 373 lb-ft of torque at 4,400 RPM. Touch base with us to discuss purchasing or financing options that are right for you and experience the difference you will only find at DRIVING FORCE Vehicle Rentals, Sales and Leasing.